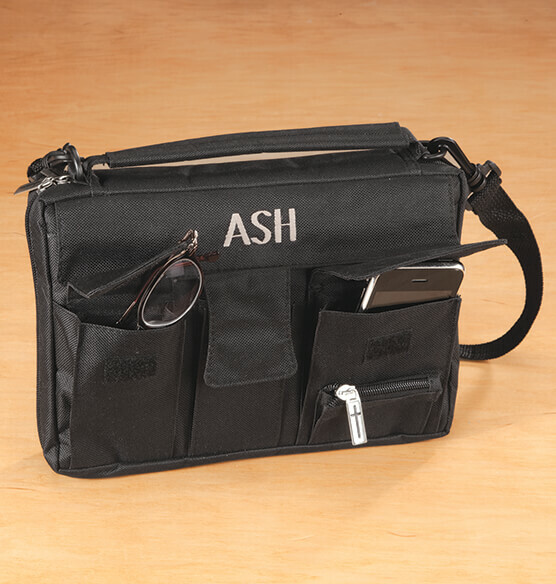 Stylish, personalized Bible case is a beautiful way to carry your Bible and study essentials. 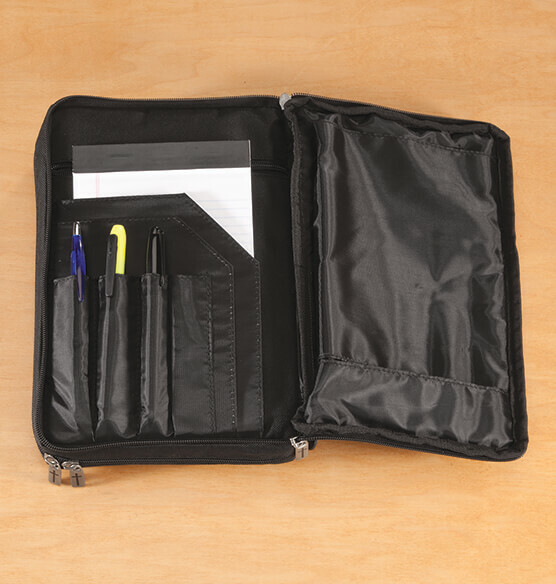 Perfect for men and women, elegant black Bible bag features 2 main compartments to protect your Bible, notepads and study guides. 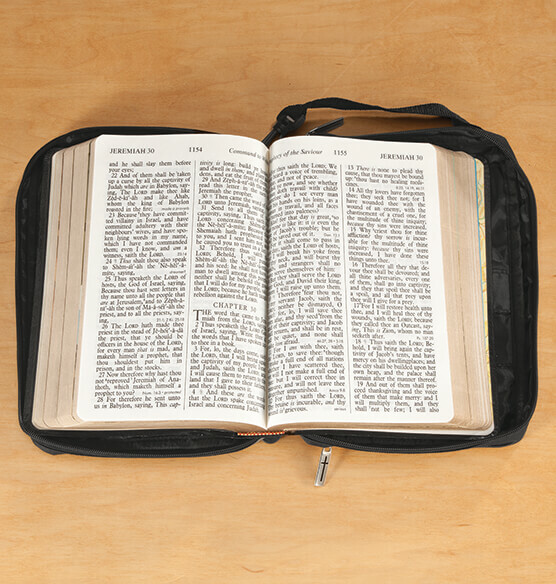 Plenty of pockets inside and out this personalized Bible cover are ideal for organizing pens, highlighters, bookmarks and other accessories, including a small exterior zip compartment ideal for coins. 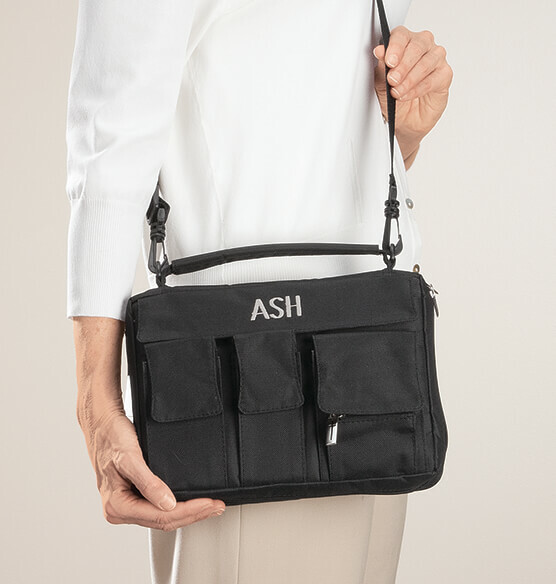 Other high-quality details include engraved cross zipper pulls and an adjustable 28" – 44" L cross-body strap for hands-free carrying. Makes a great gift! Personalize up to 3 initials; specify in order. Spot-clean polyester. 10 1/4" long x 7" wide x 1 1/2" deep. Best gifts ever to give anybody, will worth it to the penny. I got this as a Christmas gift for by friend. I like that it has a lot of organization. I also bought the recommended highlighters for her to outline her favorite chapters. I was very happily surprised when this arrived, I have never seen so many storage compartments! I'm not even sure I will use all of them. There is a place for my weekly church bulletin, notepad, pens and Bible Dri-Liters (352414), my phone, loose change and tons more. Material is very durable and will be extremely easy to clean. I will buy more as gifts. Useful for my reading pleasure and inspires my life. i keeps my dad's bible safe it is 68 years old. The case was just what I needed. I choose this case over several that I looked at because it would carry everything I use in my services. I do recommend this case and will show it to the other officiants I work with. I ordered 2 with personal id. I love them and would order more. Still might. So many pockets and still room for my Bible. I loved the personalized letters. I now have 3. I love them and they protect my Bible, my husbands Bible and our study Bible. Got this for my daughter. She really likes it. Recommend this to everyone. Bible in it right away. It is very well made. She loved that her initials were on it, and that it had a cross on the front. Compact carryall for a bible, small book, note paper, highlighter, pen, etc. Sufficient additional compartments are great. I like this because I need a bag that's not a backpack so I can take my Bible with me without bringing the house too :D plus it holds a notebook! Thank God! Like the look of it and big enough to hold my Bible. extra pockets and has long or short handle. This is what my daughter n love wants for CHRISTmas. It's what I need to have on hands tools for Study and travel. I CHOSE THIS BECAUSE OF WHAT IT IS AND THE PRICE WAS GOOD. I wanted the front pockets. Does this case come in a larger size? BEST ANSWER: Thank you for your question. We do not have this is a large size. We hope this information will be of help to you. Will it fit a 2 inch depth?